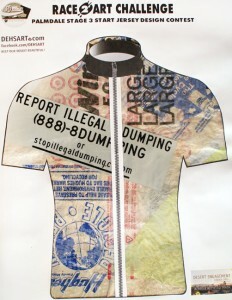 DEHSART created a “Report Illegal Dumping” jersey design for the City of Palmdale’s Race to Art challenge in conjunction with the Stage 3 start of the eight-day Amgen Tour of California–America’s largest international professional cycling race. The jersey was made using an artistic textile technique that uses heat from an iron to fuse found plastic bags and melt them together into a “sheet” of fabric. Applying a bumper sticker with thestopillegaldumping.com website and 888-8DUMPING phone number helps spread the message that illegal dumping is a crime, and waste can be re-purposed in innovative ways. 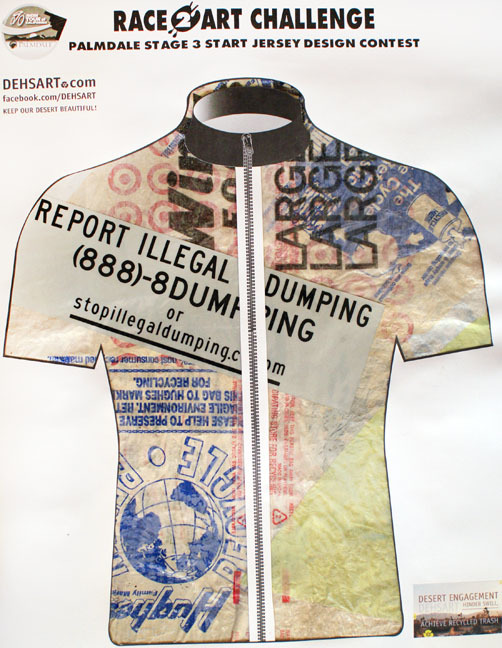 View all the creative entries here and don’t forget to vote for #26– Stop Illegal Dumping!